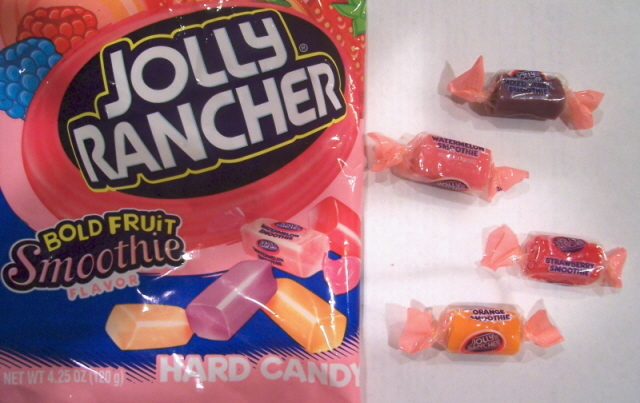 I like Jolly Ranchers because I’m neurotic and impatient – I crunch up my hard candies instead of waiting for them to dissolve, so they don’t last very long. Fortunately, Jolly Ranchers don’t crunch very well, so I’m forced to savor them. And Bold Fruit Smoothie flavored Jolly Ranchers are, for the most part, worth savoring. I picked these up at my local mall’s Dollar Tree. Unfortunately, it looks like Hershey’s is no longer making them, as their Jolly Rancher website no longer lists them as a flavor. Apparently, they were introduced way back in 2004, but no clear word on if they’re still being made. At any rate, the code on my bag tells me that they’re good until August 2008, so no worries there (Cybele at Candy Blog has the key to deciphering Hershey’s codes).